I’ve always liked shawl-collar cardigans. One reason is that I have a long neck, which benefits from a collar. T-shirts and round-neck sweaters tend to make me look scrawny. Shirts, polo shirts and polo-collared sweaters provide more support. This links to the second reason, which is the shawl collar’s versatility. A T-shirt is fine for Sunday mornings, but a shirt and tie also works for dress-down Friday. And it is the default choice when I get home because I know it will work with whatever else I am wearing. The shawl-collar cardigan is more comfortable than a jacket around the house and more stylish than a normal cardigan. I always like clothes that are functional as well, so the fact the collar can usually be turned up and buttoned across appeals. I have a few favourites. One is an old charcoal Ralph Lauren I bought during a conference in Chicago years ago. A second was an acquisition earlier this year from Albam – in a chunky cotton, which is unusual, and the last style they had made by Stevenage Knitting. And the third is the Drake’s cashmere sweater pictured. Michael Drake calls the sweater iconic. I’m not sure I’d go that far, but it has certainly been popular (as demonstrated by the special orders now available) and I’ve coveted the flannel grey version for going on a year. Having finally secured it, I recommend going for a relatively big size – I’m a 39-inch chest, but the XS (38 inch) was rather too short in the body and the S (42 inch) fit far better. It is not a very slim fit, but then a comfortable sweater like this shouldn’t be. You can follow the discussion on The virtues of a shawl-collar cardigan by entering your email address in the box below. You will then receive an email every time a new comment is added. These will also contain a link to a page where you can stop the alerts, and remove all of your related data from the site. 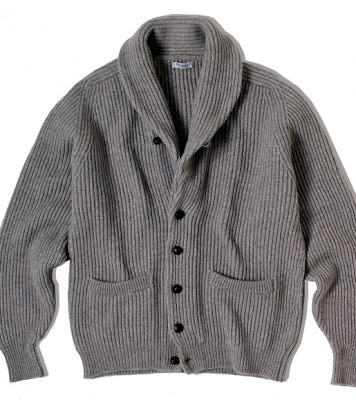 You might also like the shawl collar sweater made in lambswool and sold by Ben Silver. Far better quality and finer features than is found on most woolen shawl sweaters and less expensive than cashmere versions. I`ve been always enjoying reading your blog. One question but what kind of style do you recommend for people with relatively short neck? I am in the market for a shawl cardigan. Unfortunately, as a student, Drake’s beautiful Version for 700 is completely out of the question for me. Can you recommend a cheaper alternative? following your suggestion I did some additional research and got lost in the byzantine online world of scotish cashmere: It appears to me that Drake’s wonderful “Iconic Shawl Collar Cardigan” is in fact identical to William Lockie’s “Windsor Shawl Collar Jacket”. For some strange reason however this producer (Lockie) has absolutely no intention at all to sell those, but instead lists a couple of phone number. Using those I eventually ended up at “Heather Wallace” which appears to be an online shop which offers the very same cardigans as Drake’s but makes no mention of William Lockie at all. Looking at the source code and credits of the homepages it appears that they (Wallace and Drake) are connected. I feel confused. Do you know if the Drake’s model is cut exactly the same Lockies own ‘Windsor’ model? As the arms are far too baggy in my opinion.